Located directly on the Bagnell Dam Strip, Casablanca is one of the town’s favorite bar and grills. Outside seating, new owners, and a new menu have given Casablanca an atmosphere as the perfect relaxation spot for everyone to enjoy! Casablanca is known for their famous casadog, along with piled high nachos, outstanding sandwiches, a mouthwatering breakfast menu on the weekends, and great drink prices. 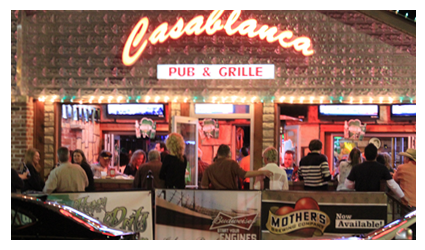 Shop, dine, and have a blast on the Bagnell Dam Strip and make Casablanca your new hot spot! 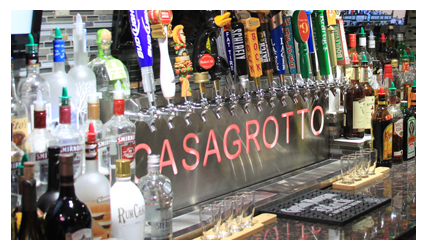 Casagrotto is located in the lower level of Casablanca and features the best pizza at Lake of the Ozarks. Whether you’re in the mood for a traditional pizza, one our specialty pizzas or making your own creation, everything is made with the freshest ingredients and cooked in our custom-built brick oven. Our traditional pizza has our house made tomato sauce, and proprietary five cheese blend. Grinders and sandwiches are also available and with 21 draft beers on tap…you’ll never go thirsty! Starting in October we will be having live entertainment on Friday and Saturday evenings from 7 to 11. Friday nights we have Cheryl Lynn who sings everything from 70’s dance music to country. On Saturday evenings we have Don & Suzy who picks it up a beat. All songs you are familiar with. Both artists have been around the lake a long time and are fun to see. Come join us for the annual Spring Pub Crawl. Busses starting rolling at 4pm. • Unlimited entertainment…In 2012 there were 15 bands and 7 DJ’s. • Bus transportation to all 22 locations. • Pick up and drop off at participating Hotels/Motels. St. Patrick’s Day is just around corner and what better way to spend the day than a parade! The Lake of the Ozarks St. Patrick’s Day Parade will take place on March 12, 2016 at 1:00 pm on the historic Bagnell Dam Strip at Lake of the Ozarks Missouri.